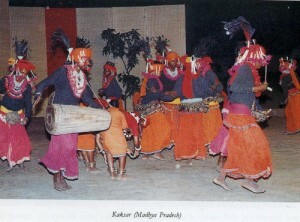 The Abuj-Maria tribal community perform an interesting dance known as Kaksar. Actually, Kaksar is a deity who is worshiped before the rains for a rich harvest. It is, however, different from the other harvest dances discussed earlier, because, according to the tradition, while the boys and girls are dancing they choose their partners for life. The marriage is solemnized later. The boys wear a fascinating costume that includes a belt of large number of big and small jinglebells (ghungroo) tied to the back side of their waist. When they dance the sound of the jingle bells enhances the appeal of the percussion music of the dance. The girls hold in their right hand waist-high iron rods having a few jinglebells on the top. While dancing they sing and strike the iron rod vertically on the ground on the accented beats of the rhythm. This sound blends well with that of the jingle bells worn by the boys. The girls form a semicircle and each dancer holds the iron rod in her right hand and the waist of nearest dancer with the left hand. The boys form a semicircle in front of the girl group. Both move in circles. While Mandar and Timki provide the percussion music, Bansuri, the flute provides the melodic component of the accompanying music. The Dhobi community of Uttar Pradesh sing and dance on every social occasions including child birth. Men and women both participate in the dancing. They usually dance in. circular formations. The accompanying music is provided by Dholak, the drum with two faces, and a folk version of Shehnai, the reeded wind instrument. The women of Dafla tribal community of Arunachal Pradesh dance on the occasion of a child birth in the community. They dance in semicircular formation, each dancer holding the waist of the two dancers flanking her. They sing while dancing. No musical instrument is used. The waist girdles and iron chains produce a tinkling sound that becomes the percussion music of the dance. Women of the Mali community of Kishangarh region of Rajasthan perform Chari dance on the occasion of the birth of a son. It is also called Charwa. Chari literally means a brass pitcher. The dance is called Chari because each of the dancers balances a brass pitcher on her head. On the mouth of the pitcher is put a bowl of fire; flames going up more than one foot high. The dancers spin and make swaying movements yet they never lose the balance of the pitcher. The dancers wear their best dress and dance to the music of Dhol, the drum, Shehnai, the reeded wind instrument, and two idiophones, namely, Thali and Bankia. The Adis are one of the major tribes of Arunachal Pradesh. Their marriage ceremony is called Nyida Parik which has its own characteristics and style. There is also a legend associated with the Adi marriage. It is as follows: Donyi is the sun god. His daughter is Dony Mundi. She was married to Abo-Tani, the father of all human beings. Their marriage ceremony was a grand affair. Marriage of anyone of the Adi community should follow the same ceremonial rituals. After completion of preliminary arrangements of marriage agreed upon by both the parties, the bride party along with the bride is invited to visit the house of the groom. A grand reception awaits the bride party at some distance from the house of the groom. In the reception is included the dance of two groups of male dancers. The dancers of one party wear hats made of cane and decorated with beaks of horn-bill. They hold poles called Yoksa. The dancers of the other party wear hats made of cane but without any decoration. They hold brass plates. When the bride’s party comes nearer the dancers start dancing and hitting the poles on the ground and beating the brass plates rhythmically. The dance is usually in faster tempo. The horn-bill signifies the nobility of the groom’s family and the brass plates implies that they speak in a pleasant voice. In other words the dance in the reception express symbolically that the groom deserves the bride.